While most items are self-explanatory, some aren't, and I was wondering if there was a glossary explaining all the properties in each of the response types? 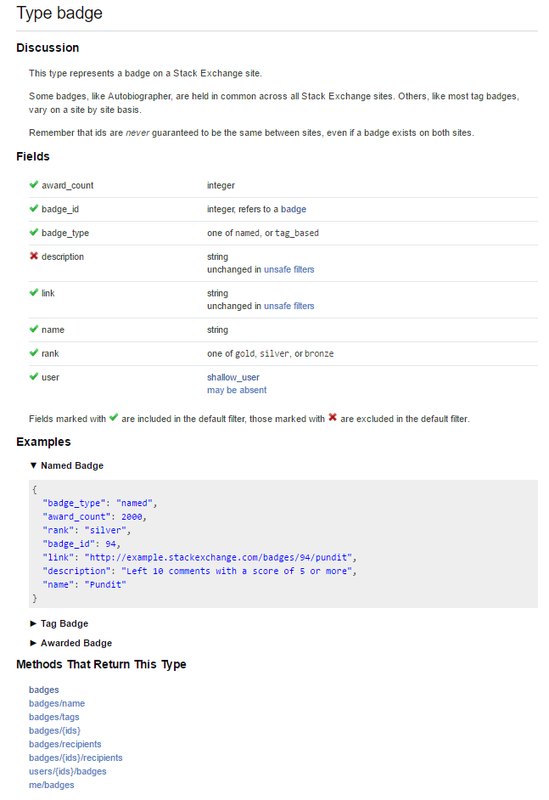 The API documentation does do this somewhat, more below, but needs improvement. There is a feature request to allow users to edit the documentation. Please go upvote that now. Anyway, each of the properties is listed in the documentation of the object that contains it. A general overview of the object. A list of properties ("Fields") that are potentially returned. The type of those properties, whether they are returned by default, and whether they need an authenticated user to access (denoted with private_info). Examples of the output/return of the object. A list of methods (AKA "routes" or "queries") that return the object type. Rarely, you can get more information about a particular property if it is documented in the data-dump schema, but this is very hit or miss. Unfortunately, that seems to be the only way to get to these pages; there is no central list. 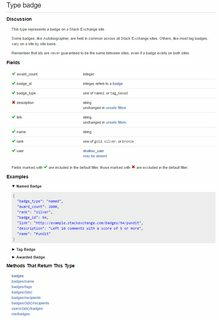 There is no such glossary in the official API documentation. The fields used in the API are similar (but not identical) to those in SEDE and the public data dump, so you might have some luck in the Database schema documentation for the public data dump and SEDE. Not all fields are documented there, but because that Q&A is publicly editable (unlike the API documentation), we (the Stack Exchange community) can easily add some clarification if necessary. How many simultaneous queries may I make of the same Stack Exchange API?